Time for a magic show I got to watch today. I am embarrassed to show you this photo. It is the inside of my refrigerator. Something spilled behind the drawer and it dried on. Who knows how long it was there. And then, I went to clean the drawer one day and I pulled it out and I saw the horror of this dark brown GOOP. And I scrubbed at it with 409 and it did not budge. I did not want to use anything too harsh, I mean, I didn't want the odors and chemicals around all my food. So I stuck the drawer back in the fridge and figured I'd think on it awhile. And time goes on. And I forgot about it. Until a few days ago when it was time to clean out the drawers again and I saw it. And then I saw a post on Crunchy Betty's website about oven cleaner. And I thought... if it will work on ovens, surely it'll work on my refrigerator. So I mixed up a batch, crossed my fingers, and prepared myself for some elbow work. Yeah, it is VERY ugly. Shudder! And I sprinkled some baking soda like she (Crunchy Betty) said to do. But I'm not patient and did not leave it overnight. Maybe 5 minutes. And then I used the oven cleaner and MAGIC happened. There was no elbow grease. It was like wiping up a puddle of water. It just wiped up like... well MAGIC. I'm not even exaggerating here. I was so excited I wanted to clean the entire fridge except that I was too excited and had to take a second picture and come blog about it and then clean the rest of the fridge later. Which I now know I won't have to dread (except for moving all the food out, which is a pain) but the shelves and everything are gonna just wipe down like a breeze. Mix all ingredients together and put in a spray bottle or a bowl. I didn't have an empty spray bottle so I put mine in a bowl and dipped my towel in it. Sprinkle the messiest parts with baking soda and then spray the Magic Spray and wipe up. Simple. UPDATE: I have used this several times. I don't usually even bother with boiling the water. It works GREAT. It even removes soap scum without any hard scrubbing. Yes, this was the same refrigerator! This is a recipe from my childhood. I do not know if it is a southern dish or a northern dish that traveled south. My memories of this dish are from when my Grandma Bettie made it. And, it was the ONLY way I would eat peas as a kid. No kidding. I normally would use a red apple for contrast but I was out of apples and my neighbor, being an awesome neighbor, lent me an apple and it was green, and so that was a perfect apple. Thank you Andrea! Oh, and I made this from a childhood memory so I don't know if it is the "right" way to make pea salad, but I'm pretty sure this was a popular dish in the 1970's. It should make a come back. It's good. Plus, it might get your kid to eat peas. In a small skillet, bring peas to a boil and cook for a few minutes. Drain, return to pot. Add butter, salt and pepper and allow peas to cool completely. Chop one apple, leaving the skin on. I try to cut it as close to pea size as possible. Do the same with the cheese. Mix the cooled peas, the apple and the cheese in a bowl with the mayo. Refrigerate and serve cold. Yes, this is a bit (okay, more than a bit) carb heavy for a girl who is supposedly going low carb. I keep waffling on that. One day I'm low-carb, one day I'm moderate carb and the next I'm just "grain-free" but not actually low carbs. That's how I can justify potatoes, which are like one of my favorite food groups. (Potatoes should be their own food group, should they not?) Now, the loaf of white french bread hiding under the (nitrate free) sausage, slathered in homemade mayo? Yeah, um... no excuses for that lovely crunchy carb on my plate. The main thing for me is to try as hard as possible to stick with real food ingredients. The coleslaw is a bigger portion than it looks, it's called perspective. I did NOT have three times as much as potatoes as cabbage... or maybe I did. Anyway, it's what we had for dinner and it hit the spot. By the way a few twists to mention: the coleslaw I used up the rest of the homemade Caesar Salad dressing I made the other night. The other twist is that the potatoes are the Salt & Vinegar recipe I tried out from Noble Pig's blog and man are they GOOD. So... what's for dinner at your house? So yesterday, I finished up making a batch of chicken stock, and with the chicken from that stock I made Chicken Tacos. There was enough meat for two more meals. Tonight I used part of it to make a Coconut Chicken Curry. Saute diced onion and bell pepper in lard or coconut oil. When onion starts to soften (about 10 minutes) add garlic and pineapple. Then put about a tbsp of butter in the skillet followed by the flour. Stir the flour in until it coats the vegetables and fruit. Add coconut milk and stir until the sauce thickens a bit. Last put in the curry and chicken and cook until chicken is heated through. Yesterday I had a big pot of homemade chicken stock simmering away, smelling up the entire house. I knew that some of the chicken that was making the stock was going to make chicken tacos for dinner. Sometime in the morning I cut up some tomatoes, peppers, onion and a few cloves of garlic, tossed them in some salt and pepper and olive oil and roasted them for 25 minutes at 425. Then I pulled them out to cool. At my kids naptime I pulled the chicken out of the stock and set it on a cutting board to cool. Just as they were waking up, I pulled off a big bowl of meat that will be enough meat to make 3 meals. Blending up the tomato mixture makes a delicious roasted tomato salsa/ sauce. With all this homemade salsa & slow cooked chicken I figured it'd be a shame to wrap it up in a cardboard (I mean, store bought) tortilla, so while the chicken was cooling, I quickly tossed the ingredients together to make homemade tortillas. Melt butter in a skillet and add flour. Whisk until the flour is coated and cooked a bit. Add milk and whisk all the lumps out. Add cheese and keep whisking until sauce thickens. Add chicken, salsa and seasonings. Just cook enough to warm the chicken through. I added a ladle of my homemade chicken stock just for the extra nutrients and simmered that until it thickened up again, but that is optional. Serve on warm tortillas with chopped lettuce, dollop of sour cream and extra salsa. This dinner really hit the spot! Bold, juicy, spicy, earthy, salty and a bit sweet it hit all over the palate. Definitely worth trying out! 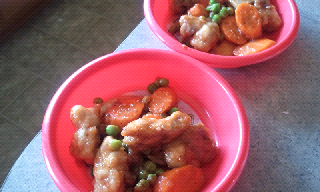 I got the recipe/idea from watching 10 Dollar Dinners with Melissa D'Arabian on Food Network. I did not follow her pesto exactly, but took it as a launching pad for my own. One tip, taste the pesto sauce as you go, and adjust as needed. It isn't finished until it tastes good on the tasting spoon. It may need a bit more acid (lime juice) or perhaps it's too acidic and needs more olive oil... just adjust to your preferences! I served it with Sweet Potato and Beet Hash. Sprinkle steak with salt and pepper and the juice of one lime. Let come to room temperature. Grill about 3 minutes per side for a 1 inch steak. Let rest for at least 10 minutes before slicing. Char the poblano peppers. On a gas stove you can put them directly on the burner. If you don't have a gas stove you can char them under a broiler turning every few minutes either way you go. When the skin is completely black all over, place in a bowl and cover with plastic wrap. Let steam/cool down for 10 minutes or more. Peel the skin off under running water and then cut away the stem and scoop out the seeds. In a small food processor put the poblano peppers, nuts, parmesan, salt, pepper, a few tbsp of olive oil and half the lime. Pulse a few times, trying to leave it a bit chunky. Taste as you go, adding more olive oil or lime juice to balance the flavor. Chop some cilantro and add it last. Serve over hot sirloin steak. This post was linked to The Healthy Home Economist: Monday Mania Blog Link Up. I was needing some inspiration because I've been stuck on the "what's for dinner" question. I've even been making menus but if you aren't excited about your menu, then cooking it isn't thrilling either. Luckily this morning I was watching Food Network and caught 10 Dollar Dinners. I like that show for Real Food, because most of the time, Melissa D'Arabian uses Real Food ingredients, and when she doesn't they are usually easy to sub out. To save money she is a bit carb heavy, but a lot of her dishes I either make less of the carb or just go without it and it is still great. Today she made this Sweet Potato and Beet Hash that looked intriguing to me. I've been trying to eat more beets because they are so good for you. So, sure the sweet potatoes have carbs, but they still have lots of good vitamins so, in moderation not a bad thing. Hubby and I really liked this side dish. One of my twins ate almost all of hers and my other girl ate a few bites without any complaints (but she filled up on steak, because she is my MEAT eater!) As for the recipe, I linked to her recipe, but when I made it, I just went off my memory of what she did. Here is my version. Peel the sweet potato and the beet. Cut into 1/2 inch cubes. Toss in the olive oil, salt and pepper and place in one layer on a cookie sheet. Bake at 425 for about 25 minutes, flipping halfway through. In a skillet, cook bacon that has been cut into small pieces. As the bacon is cooking add very small diced onion. Saute on medium high heat until onion is carmelized and bacon is crispy. Add minced garlic and cook for a minute or two more. Add the sweet potatoes and beets to the bacon and onions and stir. I just wanted everyone to know that I haven't abandoned the blog! I've spent the past week in College Station, Texas for the birth of my identical mirror twin cousins Darianne Mae and Daylynn Joy Hill. They were born on July 25th and spent six days in NICU. Now they are happily home with my Aunt Rebeca and Uncle Darrin. It was a fun but exhausting week as I helped Aunt R travel back and forth to the hospital to help her breastfeed those two babies. Now I'm back at home and the new Mom and Dad are doing great! My identical twin daughters, Madeline and Isabelle are super excited to have (second) cousins that are also twins!